Looking for something to do this holiday season? (New York City can be so dull.) 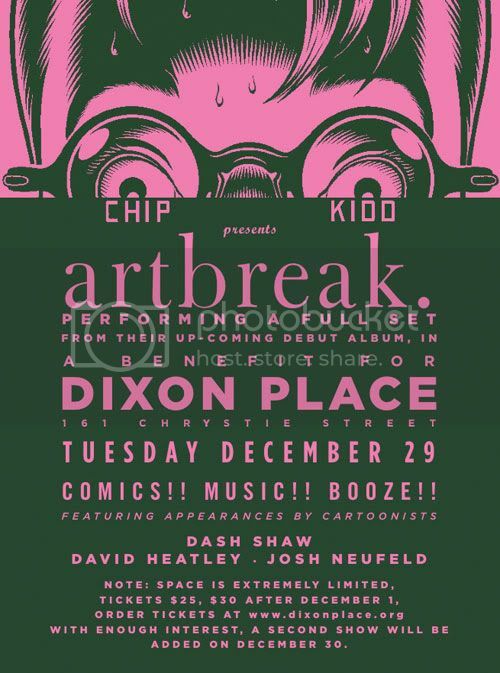 Then come check out Chip Kidd’s band artbreak — and indy cartoonists Dash Shaw, David Heatley, and yours truly — at a benefit for Dixon Place: “Chip Kidd presents an evening of music, comics, and cartoons — New York indie style. Kidd’s band artbreak (with Mars Trillion) will perform a full set in preparation for its upcoming self-produced LP Wonderground, with special guests cartoonists Dash Shaw, David Heatley, and Josh Neufeld. A visual presentation of the artists’ current and upcoming projects will followed by artbreak’s only live appearance of the year, debuting their first EP and single, ‘Speedy’." Word is that Heatley will be joining Kidd and Trillion onstage for a performance of one of Heatley’s songs as well. Original artwork and prints will be on display upstairs and our books will be on sale. Also, join Kidd, Shaw, Heatley, and myself the next day, Wed., Dec. 30, for a signing at Jim Hanley’s Universe. In commemoration of Indy Comic Book Week, we’ll all be signing our books from 5-7 pm. More details to come. ← The Comics Journal reviews A.D.